I beg the Blessed Virgin Mary to allow me to enter in spirit the humble home at Nazareth, to contemplate Jesus’ most admirable life there. 2. “Did you not know that I must be about My Father’s business?” Jesus, who was so humble and submissive, did not hesitate to make this reply to Mary when she gently questioned Him about having remained behind in the Temple without her or Joseph’s knowledge, while they in anguish had been seeking Him for three days. These are the first words of Jesus which we find recorded in the Gospel. He spoke them in order to declare his mission and to affirm the primacy of the rights of God. When hardly an adolescent, Jesus taught us that God and the things of God must always come first. He must hold the first place in our lives, and we must obey Him regardless of all other considerations, even if it means sacrificing the rights of nature and of blood. Yielding to relatives and friends is no longer a virtue—and may even be sinful—if it leads us away from the will of God or hinders its fulfillment. O Jesus, how I love to contemplate You as a Child, in the poor house at Nazareth, with Mary and Joseph! Your simple, humble life was just like that of any other child of Your age. You, the splendor of the Father, did not wish anything to distinguish You from the children of men; You, uncreated wisdom, wished to learn from Mary and Joseph, Your creatures, the ordinary little details of life. Joseph showed You how to handle his tools and You watched Him attentively, You learned and You obeyed. Mary taught You holy hymns and recounted tales from the Sacred Scriptures; You listened to her like a humble disciple, You who are the one true Teacher, You who are Truth itself. No one, neither Your relatives nor Your fellow townspeople, knew who You really were. Everyone believed You to be the carpenter’s son and paid no more attention to You than they would have paid to an ordinary apprentice. 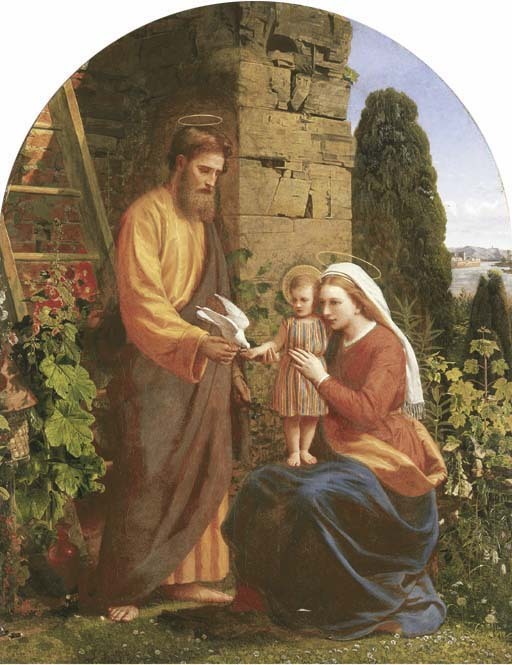 Only Mary and Joseph knew; they knew by divine revelation that You were the Son of the Most High, the Savior of the world, and yet they knew it more by faith than by experience. Your ordinary way of life concealed Your majesty and divinity from them so completely that when, without their knowledge, You remained among the doctors in the Temple, they could not understand the reason for Your unusual behavior. That incident, however, was an isolated one; immediately afterward, You wished to return to the hiddenness of Your most humble life. You went back with them, and were subject to them. And this, day by day, until You were thirty years old. O most sweet Jesus, grant that I may imitate, at least to some degree, Your infinite humility! You, the Creator, were obedient to Your creatures. Teach me to bow my proud head and willingly obey my superiors. You came down from heaven to earth. Give me the grace to humble myself, to come down, once and for all, from the pedestal of my pride! How can I bear the sight of Your humility and self-effacement,O my God and my Creator, when I, who am nothingness and sin, use the gifts I have received to set myself above others, to prefer myself even to my superiors?